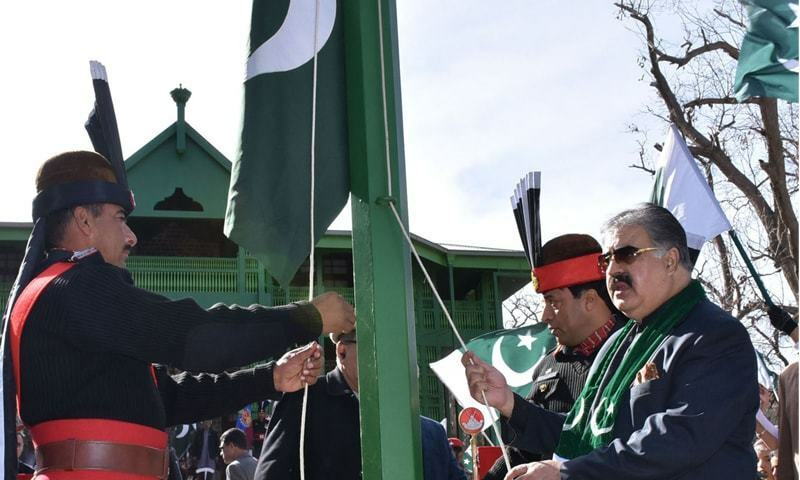 Chief Minister Sanaullah Zehri hoists the national flag on Monday. ZIARAT: Balochistan Chief Minister Nawab Sanaullah Zehri on Monday paid tribute to Quaid-i-Azam Mohammad Ali Jinnah, saying that the father of the nation and his colleagues waged an untiring struggle for creation of Pakistan. He was speaking at a national flag-hoisting ceremony organised at Quaid-i-Azam Residency (also known as Ziarat residency) to mark the Quaid’s birth anniversary. Mr Zehri said the Quaid had a special love for Balochistan and its people and that was reason that he along with his sister, Miss Fatima Jinnah, had chose to spend last days of life in this province. The ceremony was attended by members of national and provincial assemblies, Frontier Corps IG Maj Gen Nadeem and others. The chief minister said his government was serving all people without any discrimination. He said a prosperous future of the country was depended on development in Balochistan. The province was rich with natural resources and had a long coastline, he added. Mr Zehri said Balochistan was inseparable from Pakistan and those who were trying to misguide the youth of the province would fail in achieving any success in their designs against the country. He criticised those who were giving guns in the hands of students and trying to pitting young people against the state. Such elements were not serving the interests of the Balochistan people, he added. He praised the role of Pakistan Army, Frontier Corps, police and other law-enforcement agencies in bringing improvement in the law and order situation in the province. For the restoration of peace, he added, hundreds of security personnel had sacrificed their lives. In his address, Maj Gen Anjum paid tribute to the Quaid. He said the Balochistan’s people had played a great role in the movement for the independence of the country. He said the Baloch people were serving effectively in the armed forces of the country. Around 30,000 Balochs were serving in Pakistan Army and other forces, he said, adding that 700 of them were posted on officer ranks.